I have tried ordering and eating noodles in various resto and chain of eateries all over the country and in some countries I have been to in Asia. None of them compare with what Mamonluk can offer. And I would even presume that those bistros offering this brand of soup possibly tried to copy the taste of the original Mamonluk flavour. Not even the well known ramen of Japan can beat it. I could just imagine how frustrated some chefs for failing to approximate the gourmet. The secret of Mamonluk could have been etched in some strange tablets somewhere not even the closest relative or one with Chinese roots could duplicate the culinary masterpiece. In the late 60s, when various Chinese food chains were dotting Manila’s landscape, there were only a handful of them that survived up to the present. There was of course, Mamonluk, Lingnam, Savory, Max’s , Aristocrat. Some were being revived notwithstanding the aggressive postures of latter day chain of eateries like Jolibee, Inasal, Chickboy, Chow King, Henlin, Razons, on the local front and multinationals, McDonald, King Burger, Wendy’s, Tropicana, North Park etc. That was also the time when dried Chinese herbs like tungkoy, star anise, tengang daga, etc would be introduced into the contemporary kitchen of an ordinary household on top of such westernized ingredients like dried pepper, curry and paste. Of these restaurants however Mamonluk was stand out and the most memorable for a number of consumers. Not only was its price at that time affordable, its taste cannot be duplicated by other eateries. More so, a Mamonluk restaurant was also the favourite watering hole of families on week ends and preferred meeting place of students, professionals and the working class. 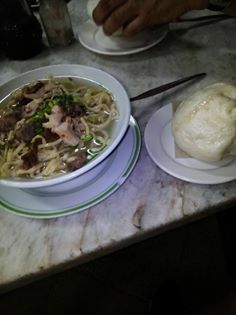 Notwithstanding the fact that it became a subject of a wild and rude rumour that its siopao’s secret ingredient came from steamed meat of stray cats, people still flocked the area for meals. I still could remember sometime ago that when my father wanted to discipline us, his children, and would require us not to toe the line, his threat not to bring us to Mamonluk was for us kids like denying a fanatic his place in heaven. That was how tasty Mamonluk’s noodles were to us! To date, the price of a pair of mami and siopao have quadrupled already. But I don’t mind. I would rather pawn my antique wrist watch in exchange of the famed duo. Posted on May 30, 2014, in Uncategorized and tagged chicken noodle soup, Mamonluk. Bookmark the permalink. Leave a comment.